Cambridge Audio Aero 5.1 review | What Hi-Fi? The new Cambridge Audio Aero range marks a move to establish the brand as a serious alternative to the likes of B&W, KEF and Monitor Audio in the heartland of traditional full-sized speakers. Take a look at the Cambridge Audio Aero 5.1 speaker system. 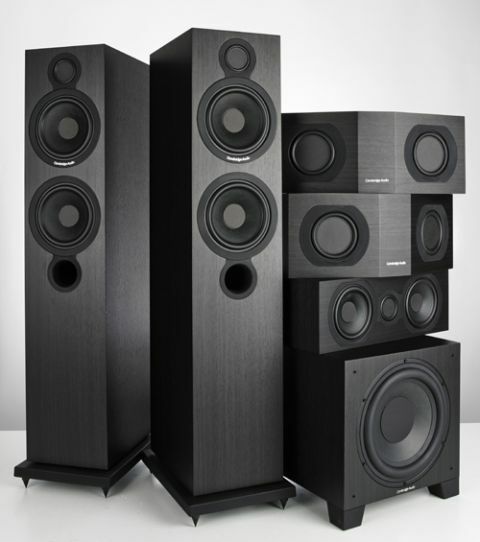 This 5.1 package is made up of a pair of Aero 6 floorstanders (£650), Aero 5 centre (£250), a pair of Aero 3 bipole surrounds (£300) and a relatively compact subwoofer called the Aero 9 (£450). To date, we’ve known Cambridge Audio best for making excellent-value electronics. Even its range topping 851 series of components (priced around £1200 each for the CD player and amplifier) pack in an awful lot of technology for the money. However, we’ve noticed recently a determined shift in the company’s product range. Over the past year or so there’s been a strong move towards speakers of all kinds, and this Aero range is another case in point. We’re big fans of the company’s small wireless Minx speakers systems, for example. It’s an entirely logical move of course, allowing Cambridge Audio to provide complete system solutions at a whole variety of prices. It’s always tough to go up against such established rivals. Cambridge’s solution is to offer something a bit different. At the heart of this Aero range is BMR (Balanced Mode Radiator) technology. Cambridge has already made good use of this type of driver in its Minx products, but here it attempts to apply the technology to much more sonically ambitious speakers. What makes BMR drivers different? This kind of driver covers a much widers frequency range than a conventional driver could, and we’re slowly starting to see more speakers with this technology included. The idea is to extend the response of a single driver as wide as possible. A conventional tweeter can be used only down to around 2.5kHz, where the 46mm BMR driver used in both the Aero 6 floorstanders and Aero 5 centre reaches right down to 250Hz. That’s a massive advantage and moves the crossover point into a region where our ears are far less sensitive. A BMR works as a conventional pistonic driver at low frequencies, but as the frequency rises (to the point where a conventional driver starts to beam) it uses bending mode radiation to reach up the frequency range. This bending wave operation ensures wide dispersion characteristics even at very high frequencies. It sounds fairly simple, but there’s an awful lot of development needed before the results approach proper hi-fi standards. All that means that the crossover point to the dedicated bass drivers is moved to a region where our ears are far less sensitive to the inevitable phase and crossover distortions that are part and parcel of any such frequency handover. The Aero 6 towers are a reasonable 98cm tall. Their relatively slim proportions keep them just on the right side of imposing. The BMR driver at the top looks similar to a conventional tweeter – this is an intentional move, as Cambridge knows that customers don’t quite trust anything that looks unfamiliar. Below the BMR sit a pair of 16.5cm bass drivers, which certainly promise plenty of bass. The speaker uses a single front-firing port, which should make them a little less fussy about placement in relation to a wall. And, indeed, we didn’t find these towers particularly finicky about positioning. Given just a little room to breathe they sound balanced enough. The Aero 5 centre speaker uses a similar driver complement, but here the BMR is centrally mounted and flanked by a pair of 13.5cm bass drivers, which provide the low-end reinforcement. In this case the speaker uses a sealed cabinet to give more controlled lows and make it more tolerant of rack mounting. We like the Aero 3’s bipole surround speaker design. It’s a good way to get a really solid and convincing surround field. Each unit has two 85mm BMR drivers covering a frequency range of 80Hz – 22kHz. There’s no need for additional bass drivers, as rear speakers generally don’t need to handle as much low-frequency information as the fronts. A processor can redirect any really deep bass to the subwoofer, anyway. While the 3s generally work in a conventional bipole design, Cambridge has configured them so that each of the two BMRs can be used independently. Bipole designs are great for surround sound duties – this configuration fires sound both forward and behind the listener making the sound field more ‘wrap around’. But there’s more flexibility here. Take out the connecting strips between the terminals and each of the drivers can be connected to a separate channel, so the more forward driver can act as the surround speaker while the rear unit performs surround-back duties. It’s a neat solution, particularly as the 3s make the most sense when wall mounted. Cambridge has even integrated wall-mount fixings into the design. A single Aero 3 could also be put into service as a surround-back speaker. The wide dispersion of the BMR drivers makes it ideal for this position too. The Aero 9 subwoofer is a decent size, being a broad 34cm cube. A casual glance will reveal it has two 25cm units, but all is not quite as it seems. The forward-facing unit is driven by an internal 500 watt class D amplifier, while its downward facing partner is a passive radiator. Passive radiators work as a slightly more tuneable reflex port and don’t suffer from air noise even when pushed hard. If done properly, the results with these can be really good. Put all this technology together and you have a very talented 5.1 speaker package. Straight from the off it’s obvious that this Cambridge Audio Aero package is something different – and yes, special. There’s a wonderful cohesion to its sound that few conventional alternatives get anywhere near replicating. The use of identical BMR drivers on the front three speakers works brilliantly, thanks to the wide dispersion characteristics of the technology. There’s a seamlessness to the way sound pans between the speakers that’s a pleasure to hear. This quality extends to the rear channels too. In our set-up, we used the Aero 3s in bipole mode, and it works really well, delivering a solid and convincing surround effect. Watch a film like the rather silly Wrath of the Titans and this Cambridge Audio package is right at home. Its sound is packed with detail, strong in dynamics and there’s a totally enveloping sound field. At the film’s climax we’re engrossed in the action, which is just as it should be. The package’s BMR drivers produce a stunningly direct sound that excels in focus, and makes most conventional alternatives sound a little soft and blurred in comparison. There’s no shortage of attack, and we were often surprised by the punch on offer. Move onto a music Blu-ray such as Michael Jackson’s This Is It and this Cambridge Audio package continues to impress. It renders rhythmic drive really well, allowing tracks like Smooth Criminal to charge along at full throttle. This package is really articulate and has plenty of subtlety when required too, as the rendition of Man In The Mirror shows. Jackson’s vocals are as expressive and emotional as you could wish for, and it’s a pleasure to listen to. Tonally, this system sits on the lean side of neutral. The upside is a lovely agility that can track changes of intensity with ease. The downside is that a certain amount of care has to be taken with the rest of the system. Choose slightly bright or aggressive electronics and this system will give you nowhere to hide. Flaws? We’ve noticed a lack of top-end refinement with earlier BMR drivers and there are still some signs of that here. This latest generation has certainly become cleaner and more refined at higher frequencies, but there still isn’t quite the sweetness, discrimination and refinement of the best conventional tweeters around. We like the subwoofer. It’s agile and detailed while integrating really well with the rest of the system. However, push hard and it’s possible to get it to bottom out relatively early. We ended up turning it down more than once. Lastly, our review samples were straight from the first production run. While overall build was fine, we did notice the front-firing port from one of the floorstanders was a little loose – we’ll give Cambridge Audio the benefit of the doubt, as the rest of the package was nicely made for the price.